Ancient Greek soothsayers believed they could read signs of forthcoming events from the flight of birds. 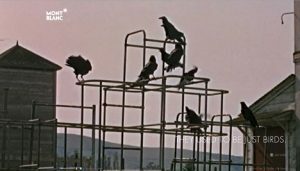 Today we have documentary films showing the amazing flocking behavior of birds threatened by a raptor from which we can read that we as humans need to develop a collective intelligence akin to that developed by birds with their swarm intelligence. 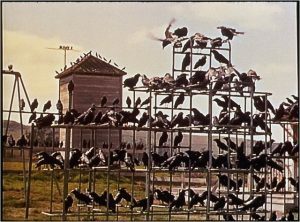 Only if we humans were able to behave as thousands of birds instinctively do when they follow the natural rules of swarm intelligence to save their lives, we would be birds, not people. Evolution has endowed us humans with a brain whose intelligence doesn’t necessarily subscribe to the dictums of swarm intelligence. The freedom of the spirit to make its own individual decisions is a hallmark of humankind on this planet – with all its advantages and drawbacks. If we want to behave in a collectively intelligent way, what we need to do is draw up our own patterns and rules which favor and promote such behavior. This would by no means rest on rational enlightenment but would much rather be a matter of the energy that grows out of emotional consensus. One of the principles human behavior has always followed up to present is – I will do what I want to do for as long as I can do it in one way or another. If we believe that the patterns and rules governing our behavior must be geared to exploitation of our potential collective intelligence, then this process of change must begin by asking and addressing such questions. I must know precisely why I am doing this and not something else – even when at first glance and in the first instance it might seem that I am neglecting my own interests in favor of the survival of the majority – which, after all, and ultimately includes me at the end of the chain of action. Is this the hurdle of evolutionary consciousness that we need to cross in order to behave in a collectively intelligent way? One question which continually occupies me when I watch the daily behavior of birds is how comfortable is a species like birds in adapting to the radically changed life conditions we humans have imposed over the past hundred years. On the weekends when I’m in the country, as twilight gathers I see how all the birds, even the big birds like ravens, magpies and herons, always congregate in the trees or remote places and stop their chatter. But during the week when I’m in town and step out onto my balcony in the dark I see that birds in the city stay active deep into the night – droves of ravens still very wide awake fly over the rooftops and perch on the gables and cables of the street lights. And I ask myself if these city birds are feeling fine flying around so energetically in the dark? When do they get rest? Is there a limit to the amount of noise and artificial light they have to endure? Or are they mutating together with us into a world that has nothing to do with the world they came from? The Archaeopteryx is the earliest known bird ever to have been found. It lived during the Upper Juassic period about 147 million years ago. 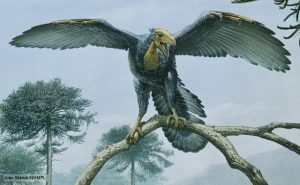 It had clawed fingers, wings and toothed jaws – part dinosaur, part bird. As far as I know, birds are descendants of the extinct dinosaurs which makes them pretty resilient- as we say today – in terms of evolutionary history. But perhaps we’ll reach a point where they as a species have had enough of being resilient. 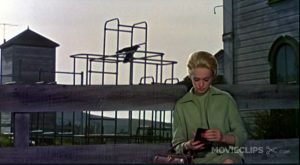 I wonder if some such similar thought didn’t cross Hitchcock’s mind when he was planning his film “The Birds”? There is the microscope, there is the telescope and now there is the Oubeyscope” someone recently wrote me who’d delved a little deeper in his thoughtful exploration of OUBEYs works and coined this new term in a flash of serendipity. „I think your site has one of the freshest themes I´ve come across“ schrieb kürzlich ein Leser des OUBEY Blogs in seinem Kommentar. Every piece and product is a masterpiece and as such it makes the project´s public appearance to be a unique masterpiece, too.